One of the things we’re really passion about at our house is making cocktails, and sitting alongside this love of cocktails is a need for making sure we have the correct glasses for said drinks. It’s an important factor of every cocktail. We’ve worked hard over the last few years to make sure that we have appropriate glassware for most situations and we’ve only curbed our collecting because we’ve now officially run out of space (until we get the kitchen re-done that is!)! 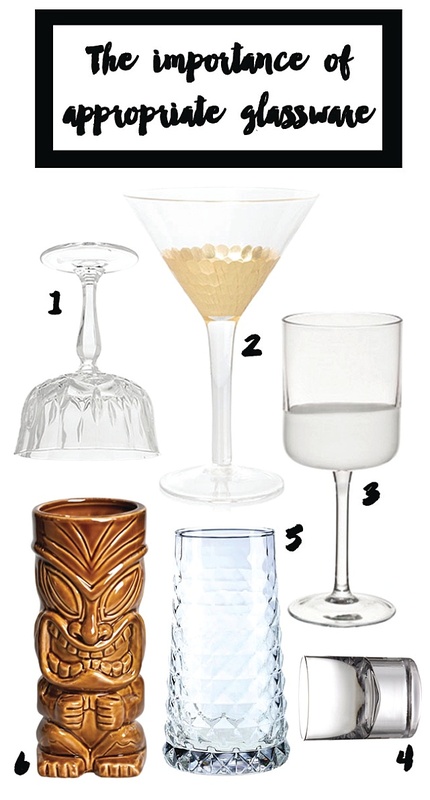 Currently our collection houses coupe glasses, a couple of different sets of manhattan glasses, gin goblets, highballs glasses, tumblers of various sizes, tiki mugs, and the obvious champagne flutes and wine glasses. 1. Coupe glasses - We find these imperative for champagne cocktails and short cocktails 2. Martini glasses - are always used in our house for short cocktails and strutting about feeling fancy. 3. Wine glasses - we use these for wine obviously, and the occasional Aperol spritz. 4. Tumblers - preferably with a nice heavy bottom, used for amaretto sours and old fashioned's and other short cocktails. 5. We use Highball glasses for long drinks like a gin and tonic or maybe a rum and ginger beer. And last but not least 6. The Tiki mug, which in our house are used exclusively for Zombies. We actually have two sets of zombie glasses and had to downsize as we found there was just too much booze in the big ones we bought. So, there you have my essential starter kit for appropriate glassware.